Something I've had to relearn recently, is that when it comes to creating a photograph, the most important influence in how it turns out is the way you choose to see things. And the most interesting thing was, if you'd given me the camera, same lens, settings and model, my picture would 99% probably come out looking totally different (and hella crappier, because Lara is PHENOMENALLY talented). But most of all, it'd be different because of the vision we have is different. Another way of looking at it is this - the way we all see things is completely determined by every teeny tiny bit of data we have ever witnessed (be it online, in person, in films, combined together, mixed up) - it's all jumbled together and it's a big blobby mess that we like to call our imagination ('least thats the way I like to look at it). When I go into a photoshoot/post production, I am ALWAYS focusing on what I can do to the scraps of photos I have in front of me to create something that never was, something that is far more powerful than I could have imagined before hand. I look for what COULD be made, from what I have in front of me. This is the image I began with. Step 1 for me is always to think in square format, so that's always my first step. I took sections of other photographs to create the buildings on either side, I had to use careful cloning and transforming to build walls when I had none and I hacked the roof off the house to the left. To create perspective, I stole blurry ground from the bottom of another photo and composited onto the original. 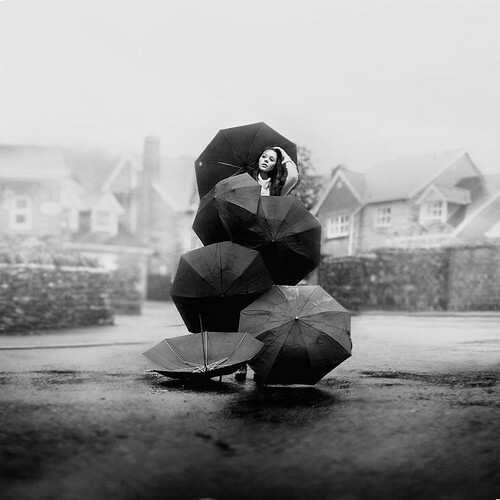 Whilst shooting I moved the umbrella around into about 20 different places. I didn't bother to create any with shadows as I am lazy and it was raining, so I did that afterwards in GIMP. Here's the final shot after doing some misting in GIMP. The smoke I took in the shots didn't comp in well, so I used a stock image of mist and another of a sky and blended it all together. I liked the colours in this, but I liked it in black and white even more so I altered contrast and tones and left it at that. Sometimes something just looks iffy in a picture. If i can get rid of it without it looking bizarre, I probably will. Who needs a roof? Mist creates atmosphere, and separates the foreground from the background. In this case, my background is an ugly set of buildings where I live (no offence mum and dad) so I wanted them to be as magical & inconspicuous as possible. The theme of excess is one of my favourites. Add multiple ANYTHING to a picture and it's bound to be way more interesting, especially if it's a pretty big size. Plus the shapes of umbrellas like this is lovely, and works brilliantly in the composition - circles! Sometimes angles in the body & expression are way more important. A prettier pic (like the final one in the outtake) would have flattered my ego, sure, but didn't work with the atmosphere in the shot and was abit blank. Plus I like the crooked angle of my arm within the circles. Rosie...thank you so much for doing the BTS after-posts! I love seeing have you create all your wonderful images. And you think those houses are boring...you should get some more of the cookie cutter burb housing in the states. You are absolutely incredible! I love watching all of your work and think it's very generous of you to give this kind of insight. Xoxoxo! first of all, this is a genius idea! i love the never seen before perspective! and i love seeing you build it. thanks a ton for sharing your brilliant in-the-making! I loved reading this. You never fail to inspire! The amount of work you put into the creation each image is phenomenal, and despite how insignificant I feel in comparison when reading these posts, please do keep making them. This is great! Do you use photoshop and GIMP, or just GIMP alone? I started off with GIMP but thought I needed to switch to photoshop to produce such nicely edited photos. I wonder is that just one umbrella that you used? It is so pretty white the dramatic black and white! wow, really makes me think about what is real, and not real in photography! Hooray for Rosie before and afters!!! I love to see how your mind works! Plus, you truly inspire so many people that seeing how you go about making compilations really gets my brain working! Love your shot and love you Rosie!! You're awesome! Awesome, awesome, awesome, awesome and more awesome. LOOOVE this. Rosie.. you are God! Really! This is a great making of, and i absolutely love the final shot. I was wondering, how do you add smoke into the pictures? If you can please do a short tutorial, or just a quick comment on how to do it, that will be greatly appreciated. Say, is there anywhere to purchase this photo? I ABSOLUTELY love it. I want to look at it everyday! Im really amazed that you able to do all this in GIMP!! they should make you a spoke person for them! crazy.. but then I have no idea how GIMP works being a photochop boy.. so strange.. I was doing this kinda thing way back when in 2000 - 2002, shooting all on film, scanning the negs and then compositing it back together in photoshop 4! but there was no online community or other community to share it with and it kinda died with me.. till i started seeing similiar stuff online a couple of years ago.. so strange.. and so much easier now! You're amazingly creative, Rosie. I wouldn't have imagined something like that from those simple photos. You're my inspiration. My 20th Birthday and a big fat thankyou!